Another month, another micellar water. Soap & Glory Drama Clean 5-in-1 Micellar Water was my second choice when I bought the La Roche-Posay cleanser last time. Oh, happy days! The packaging for this micellar water is amazing. Yes, it's pretty big and bulky but it holds 350ml. Not bad for £4! The lid is really secure and dispenses liquid slowly so less product is wasted. A perfect happy medium between the gushing of the Garnier and the dripping of the La Roche-Posay. Not to mention the fact that it's super cute! This is where I have a big problem- cucumber. I despise cucumber and, unfortunately, this micellar water smells like it might have five whole cucumbers squeezed into it. Apparently there are also peachfruit extracts but all I can smell is that cucumber. Other than this, it applies smoothly with a cotton pad and doesn't sting my eyes! Rejoice! The amount of make up and dirt this micellar water lifts is incredible. Even my waterproof eye make up is easily swiped away. Whether this is down to the unexplained D-Clog Water (seriously) is yet to be proven. 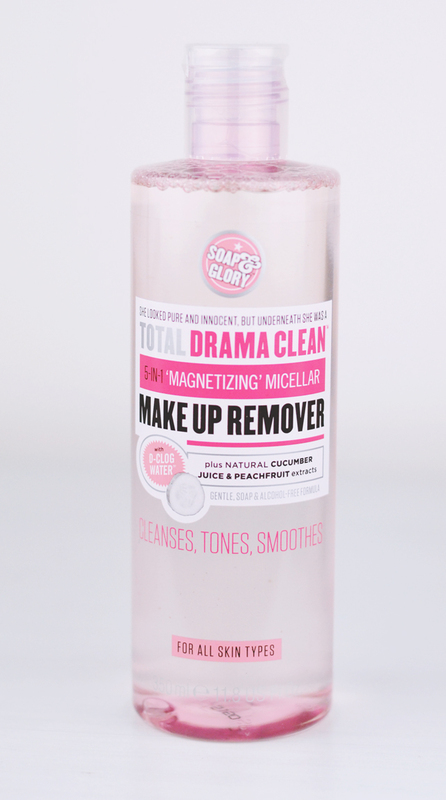 Soap & Glory have named this 5-in-1 as, according to the packaging, it's supposed to cleanse, tone, melt make up, dissolve dirt, smooth and soothe. Yes, that is a list of six points and yes, I'd argue that three of them are actually the same thing. It certainly does cleanse really well and the aloe vera and cucumber extracts leave my skin feeling refreshed, with no oiliness, stickiness or dryness. I really love this micellar water. It cleanses really well, it's soothing and it's great value for money. Unfortunately, I can't get past the cucumber smell! I'm currently working my way through a bottle of this and it's great! But yes, I agree, VERY cucumber-y! This sounds amazing, I'm currently using the Nivea one but I definitely think I'm going to have to pick up this one! Oooo, this sounds like a goody to me (I don't mind cucumber). I normally use Bioderma if I use a micellar, but its an expensive do really so will check this one out as a cheaper option. I'm sure I have this somewhere in my collection! I may have to dig it out and give it a try! I've only ever used the Garner Micellar water but now after reading this I wanna use this! Depending on how strong it smells of cucumber that is! Thats such a shame! I wanted to try this but I hate cucumber too! With a passion :( Glad it was a good cleanser though! This does sound good. I love cucumber and the smell of it, so I think I could deal aha! Oooh, this sounds good! I might give it a go. I'm hesitant to try new micellar waters as they always end up being a disappointment!